In Western democracies, rising levels of political alienation have prompted concerned political authorities to improve the quality of citizenship by such means as civic education. As well, the several international conventions underpinning the sustainable development discourse mandate participation to empower people in their own development. Active citizenship and the participation fundamental to it can be problematic for island communities with a history of economic and political dependence, since there exist a number of structural and agentic barriers to its practice and to the exercise of ecological responsibility through participation. 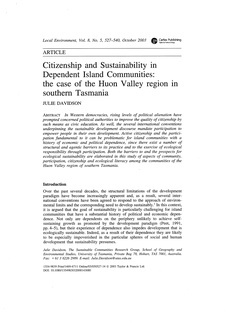 Both the barriers to and the prospects for ecological sustainability are elaborated in this study of aspects of community, participation, citizenship and ecological literacy among the communities of the Huon Valley region of southern Tasmania.